Diamonds have captivated humans for millennia, having been cherished as precious gemstones for perhaps as long as 6,000 years. Their popularity has increased even further in recent decades, as they have come to be highly prized as fashion accessories as well as practical cutting tools. 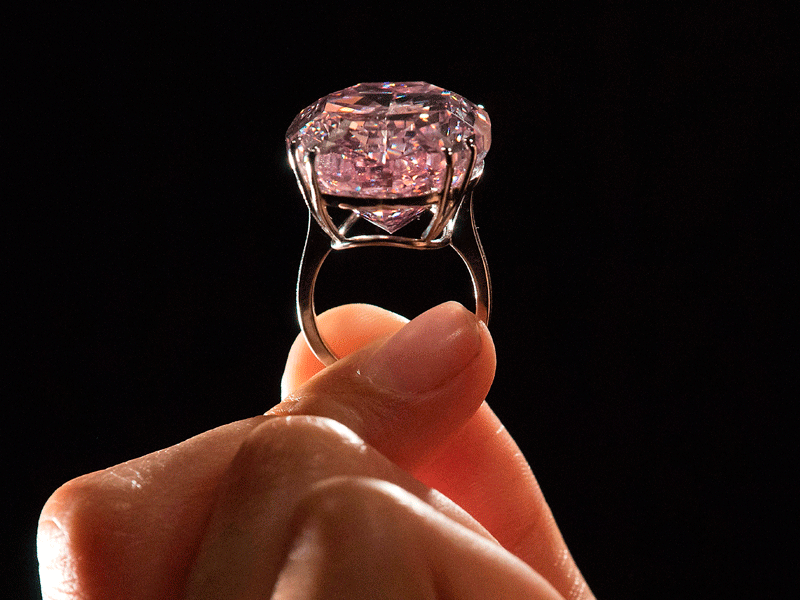 They are also extremely valuable: the most expensive diamond sold to date, the Pink Star, was purchased for $71.2m last year. And yet, despite the fact that diamonds represent huge amounts of wealth in a relatively small size, they have yet to take off as an investment asset. This is in spite of a number of efforts over the years to make them more popular among investors. There is, however, one simple fact that keeps bringing speculators back to the diamond market: there is money to be made. Over the past 10 years, the value of rough diamonds has increased by 33.7 percent, while prices for rare, cut stones have gone up substantially more. These price increases have caused the market to take notice, but as with all assets, investors must do their homework before they get involved. One of the most important rules of investing is having a diversified portfolio. Recommendations often focus on having the right mix of stocks and shares, spread across a variety of industries to protect against risk. Sometimes, however, investors diversify in other ways, such as by purchasing real estate. Another option involves investing in movable assets like jewels and precious metals. Although diamonds are one way to invest in commodities, more often than not, investors have chosen to store their wealth in the form of gold instead. Yaniv Marcus, founder of the Diamond Investment and Intelligence Centre, explained that there are a multitude of reasons why diamonds have not traditionally received the same prominence among investors as gold. Even though many of the financial institutions that manage gold have, in the past, been accused of manipulating the value of real assets, the extra credibility they have given the gold market ensured the metal came to be viewed as something of a sure bet. 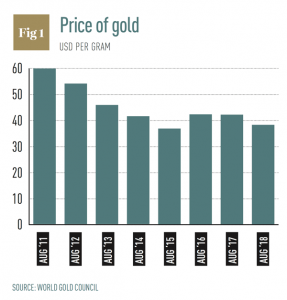 In fact, gold has historically been seen as a safe-haven investment, particularly in times of economic trouble. Its value is not directly impacted by government actions, such as raising interest rates, and it has maintained its value over a prolonged period of time. But regardless of its long-term durability, gold is not immune to volatility. In fact, the precious metal is in the midst of a prolonged decline in value, with prices falling steadily since a 2011 peak (see Fig 1). With the global economy looking increasingly robust, there are no guarantees that gold will arrest its downward spiral any time soon. Investors looking at commodity assets, therefore, should view diamonds as a potential alternative. The benefits of investing in diamonds are manyfold. First, they are an extremely compact form of wealth: they are easy to store and transport and require hardly any maintenance costs. As the hardest substance on Earth, diamonds are also extremely resolute. Like other commodity assets, they are inflation-proof but, unlike gold, their value has increased over the last few years on average. Perhaps the most compelling argument for investing in diamonds, though, is the fact that using them does not reduce their worth. They are an investment that can be enjoyed in a way that is not possible with stocks, or even gold bullion. Speaking generally, the investment space has become less of a closed shop in recent years, with plenty of websites offering beginner advice and a host of mobile apps allowing traders to speculate while on the move. This too is true in terms of diamonds, which were previously restricted to a small, opaque community of investors. One of the reasons diamond investment is becoming more popular is the expectation of higher returns. Demand in developing economies, including India and China, is expected to grow, while the US market remains significant. Globally, the demand for rough diamonds is predicted to grow between one and four percent annually through to 2030, while supply is only forecast to increase by zero to one percent across the same period. And, of course, when demand outstrips supply, price increases are sure to follow. The rise of diamond investing, however, is not driven by economics alone. The market is opening itself to innovative developments that give investors something different to think about. Late last year, the Singapore Diamond Investment Exchange launched Diamond Bullion, a new, standardised form of the stone that should make trading less subjective. Diamond Bullion is a collection of investment-grade diamonds stored in portable, credit-card-sized packages and issued in denominations ranging from $100,000 to $200,000. It is tamper-resistant and each package comes with a unique serial number that can be instantly verified using a smartphone app. Not only will this new development help standardise the diamond investment market, it will also bring greater transparency. Similarly, in April 2018, the Indian Commodity Exchange launched a 30-cents diamond future contract, adding to its existing one-carat and 50-cents contracts. This is another example of the way in which diamonds are increasingly viewed as a viable option for traders. The creation of exchanges that accept diamond investing helps raise awareness of the commodity, bringing it further into the mainstream. Diamond investing is also growing because the market has shown itself to be more robust than initially thought. In recent times there have been a number of scares that threatened to send prices plummeting, only for values to hold firm. There was a perception that Anglo-American firm De Beers continued to dominate the diamond trade, something Marcus claims no longer holds true. “There is still a misconception that De Beers controls the market,” Marcus explained. “That is no longer the case. Up until the 1990s, De Beers controlled 90 percent of the [world’s] colourless diamonds; today, it is about 35 percent, with Russian mining company Alrosa a stronger player.” By showing that it was about much more than a single player, the diamond trade has demonstrated its durability to investors. The market also weathered the development of synthetic diamonds, something that could have conceivably destroyed the jewel’s value by rapidly increasing supply. Instead, while the price of lab-grown diamonds continues to fall, the price of their natural equivalents has gone up. Although the two are chemically identical, there appears to be no substitute for the real thing in the eyes of consumers. Despite the fact that diamond investing is more open than ever, individuals should not make the mistake of thinking it is a get-rich-quick scheme. As with any other investment, traders are advised to gain as much knowledge as possible regarding the market before risking their hard-earned cash. A good first step for investors is familiarising themselves with the four Cs: carat, colour, clarity and cut. Although the value of diamonds depends on more than just these four qualities, they will help new traders gain a grasp on why particular gems are worth more than others. In addition, as is the case with other asset classes, investors should start diversifying their portfolio by making a small acquisition and holding onto it for a prolonged period of time. Taking a long-term view is vitally important, and diamond investors should expect to hold on to their assets for between five and 10 years at least. It is also worth considering the negatives. Diamonds do not generate a yield and, in fact, could result in owners paying out for transportation or storage costs. Selling stones at an auction house will also incur additional fees that must be considered. That being said, a canny trader can certainly make a sizeable profit if they are willing to invest the necessary money and time. Unlike other assets, every diamond is unique. This means it takes more than a cursory glance at market trends to turn a novice trader into an expert investor. For anyone who wants to develop a truly diversified portfolio, however, this knowledge is worth acquiring now. As the diamond trade becomes more accessible, it might not remain a hidden gem among investment circles for much longer.